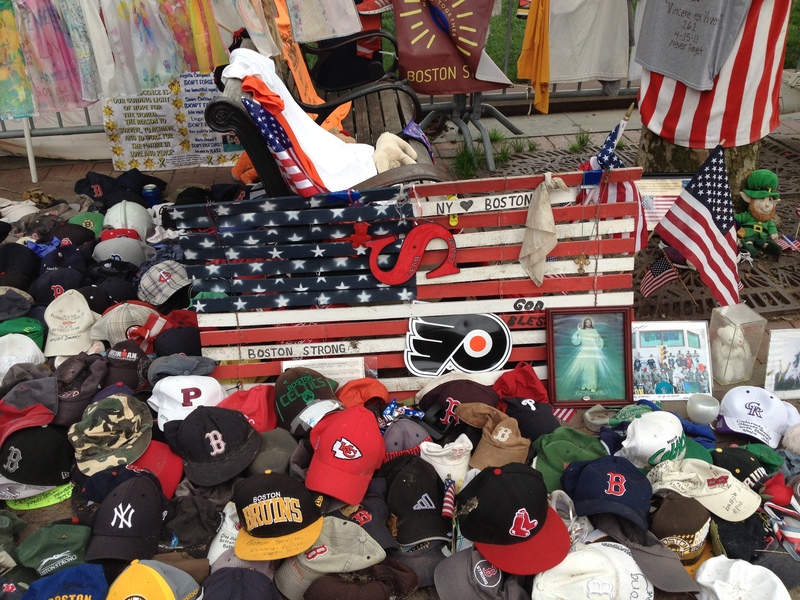 Back in July, when the insta-memorial for the Boston Bombing of 15 April 2013 was taken down, I wrote this piece at the National Council of Public History’s history@work blog. In it, I expressed my cynicism of what happens to the items of the memorial when they are removed from the site and put in storage, or even brought out again for a more permanent exhibition. I also argued in favour of insta-memorials such as this, seeing some value in our hyper-mediated lives, watching the world through the screens of our iPhones. What resulted, from the piece on history@work, as a notification here on this site, as well as Rainy Tisdale’s blog, was a rather robust discussion, especially between myself and Rainy, a Boston-based independent curator about authenticity and memorials. To sum up the discussion, we debated whether or not Boston needed an exhibition on the first anniversary of the attack. I argued that the running of the 118th Boston Marathon, as well as the traditional Boston Red Sox game at Fenway Park, would serve as a chance for Bostonians to reclaim Boylston Street and Copley Square one year later. Rainy, on the other hand, argued that an exhibition was necessary in order to prevent the kind of frenzy that began to emerge surrounding the #BostonStrong rallying cry when the Bruins went to the Stanley Cup Finals last spring (and lost. I hate the Bruins). In the time since, I have come around more to Rainy’s argument than my own, though I still worry about questions of authenticity and memorial mediation on the part of the curatorial hand (though, of course, that spontaneous memorial, first on Boylston Street and then at Copley Square was also curated, in part). Nevertheless, I am very much looking forward to Rainy’s exhibit at the main branch of the Boston Public Library on Copley Square. 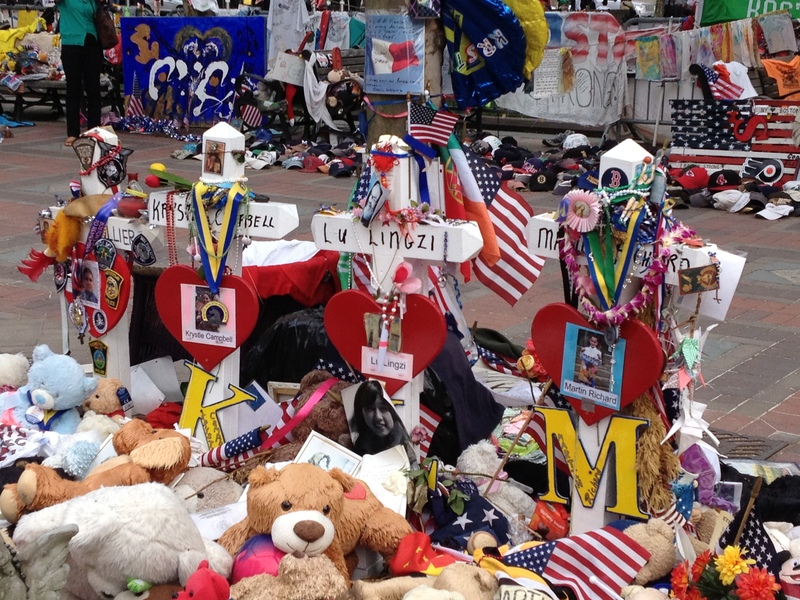 Dear Boston: Messages from the Marathon Memorial opens on 7 April, and will run to 11 May. It is a tri-partite exhibit: the first part will encompass the immediate responses to the bombing, the second will be people’s reflections on the bombs, and the final part will be the hopeful part, messages of hope and healing. I appreciate the exhibit’s title perhaps more than anything at this point, as it makes direct references to the curatorial hand at work here, as the exhibit will deliver messages from the memorial. In July last year, I worried about the loss of meaning of the individual artefacts when they were boxed up and stored in the Boston Archives. A running shoe had a very poignant and powerful meaning when displayed at the memorial, and in a box in the archives, it’s a running shoe. Restored to the public eye, however, attached with a symbolic meaning that no one in Boston, or anyone visiting the exhibit, will miss, the shoe regains its poignancy. What struck me in my discussion with Rainy last summer was how she intended to approach the exhibit, and her sensitivity to the very issues that concerned me. I am very much looking forward to what she comes up with. 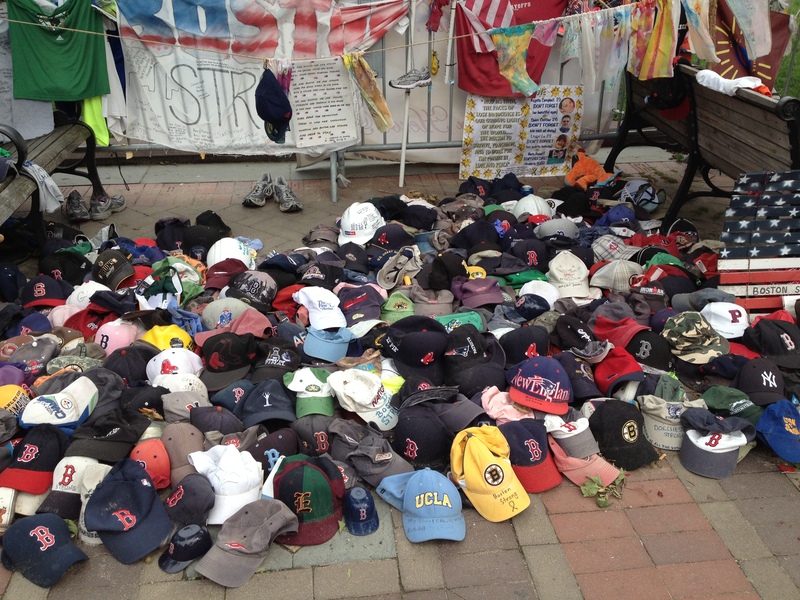 You are currently reading Dear Boston: Reflecting on the Marathon Memorial at the Boston Public Library at Matthew Barlow.